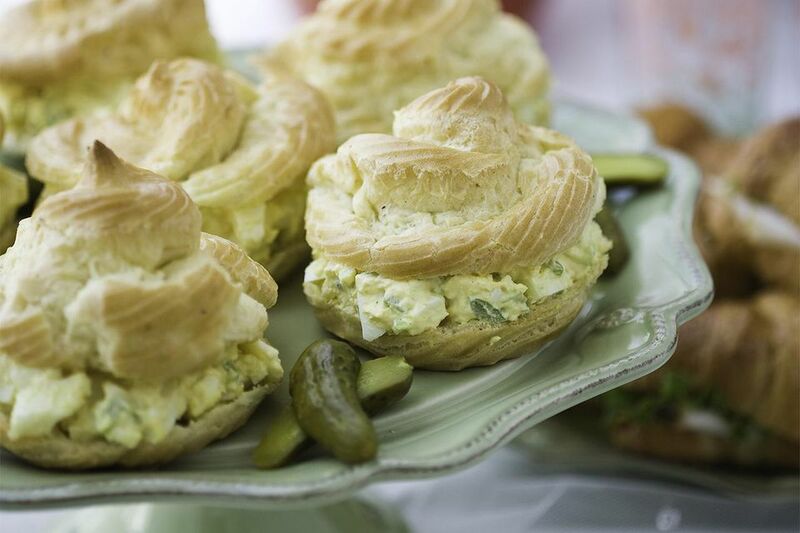 Egg salad has long been one of my favorite sandwich fillings. In fact, as a kid, I never like peanut butter and jelly, but loved egg salad. Every now and then I get a powerful yen for it again and will make up a batch then eat egg salad sandwiches for a week. Sometimes I add capers, chopped dill pickles, chopped celery or chopped green or red pepper to it. I like it on whole wheat, white bread and, my favorite, croissants. I'll make the sandwiches with or without tomatoes and lettuce depending on season and mood. Whatever you prefer, it's good stuff. (Larger image.) Makes 2 cups. Hard boil eggs (perfect hard-boiled eggs). Chop eggs and place in a small mixing bowl. Add mayonnaise, mustard, dill, lemon juice, cayenne pepper, salt and white pepper. Mix well with an electric mixer. Chill for an hour or so, then serve. *Note: If you add dill, don't add the pickles and vice versa. The capers are good with the dill, celery, and red bell pepper - but not so good with the green bell or pickles. The green bell does well with the dill and celery.